Did you catch all of our coverage from Pebble Beach over the weekend? It looks like it was quite a show, but sadly, it's over now. The good news is that we're starting our day with a piece of big news from Cadillac out of Pebble. Did you enjoy seeing the striking 500-horsepower Cadillac Elmiraj concept this weekend? Of course you did, because you have eyes. The good news is that it "stands a good chance of becoming a production model," Automotive News reports this morning. Citing Cadillac senior vice president Bob Ferguson, AN reports that the Elmiraj could be based on the new rear-wheel drive Cadillac flagship sedan set to hit showrooms in about two years. "The two-door Elmiraj coupe is very doable, Ferguson told AN. "Our dealers really want a vehicle like this." About 1,000 of Toyota's more than 1,200 U.S. dealers carry Scion. Toyota apparently made the declaration at a national dealer meeting in Atlanta this month. But it "offered a glimpse" into two future products for Scion if they don't walk away, the FR-S convertible, which is maybe on again after all, and a crossover SUV. We'll see if that keeps dealers interested. A bevy of automakers with operations in South Africa are contending with strikes this morning as 30,000 workers with the National Union of Metalworkers of South Africa ceased operations to demand higher pay, according to this Bloomberg story in The Detroit News. The union is demanding a 14 percent annual wage increase alongside improved medical benefits and shift flexibility, according to NUMSA National Treasurer Mphumzi Maqungo. South Africa has been plagued by labor strikes that have spread from the mining industry to other parts of the economy. The automobile industry accounts for almost 7 percent of the country’s gross domestic product, according to the Department of Trade & Industry. Affected automakers include GM, Nissan, Toyota, Ford, BMW, Volkswagen and Daimler. It could cost the industry as much as $69.1 million a day by reducing vehicle output by 3,000 vehicles. As you have probably heard by now, new car sales in Europe have been abysmal for a while, but they seem to be on the upswing again, which some take as a sign of economic recovery. At the forefront is Ford, according to The Detroit Free Press, whose European sales gains were double that of the entire industry overall. Ford sales rose 8.7% — up 7,200 units to 90,000 vehicles — in its 19 traditional European markets, while overall industry sales increased 4.3%. Ford’s market share in Europe grew to 8% from 7.6% in July 2012, its fourth consecutive month of market share gains. “It was welcome news to see overall vehicle sales improved compared with a year ago, and we are especially pleased that Ford’s sales rose faster than the industry,” said Roelant de Waard, Ford of Europe vice president for marketing, sales and service. 5th Gear: The Woodward Dream Cruise! Amid all the hoopla of Pebble Beach, you could almost forget that the 19th annual Woodward Dream Cruise was this weekend in Detroit. The Detroit Free Press says it was a huge hit, thanks in part to some perfect cruisin' weather. Gary Mrowiec, 61, remembers cruising Woodward in the mid-1960s with his older brother, Jim Mrowiec. Woodward was a weekend hangout, a place to show off your wheels, whatever they were. Were you there? How was it? On this day in 1909, the first race is held at the Indianapolis Motor Speedway, now the home of the world's most famous motor racing competition, the Indianapolis 500. Built on 328 acres of farmland five miles northwest of Indianapolis, Indiana, the speedway was started by local businessmen as a testing facility for Indiana's growing automobile industry. The idea was that occasional races at the track would pit cars from different manufacturers against each other. After seeing what these cars could do, spectators would presumably head down to the showroom of their choice to get a closer look. Neutral: Yeah Or Nah On The Cadillac Elmiraj? Sure, it looks great. 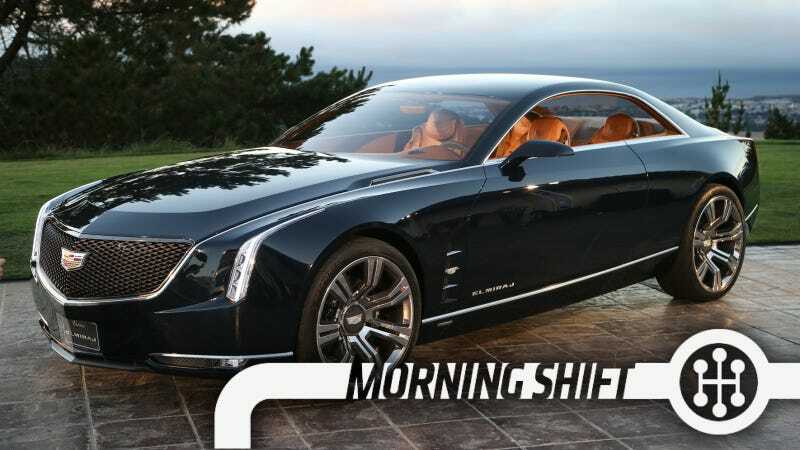 But is the big coupe the car Cadillac needs to build right now?